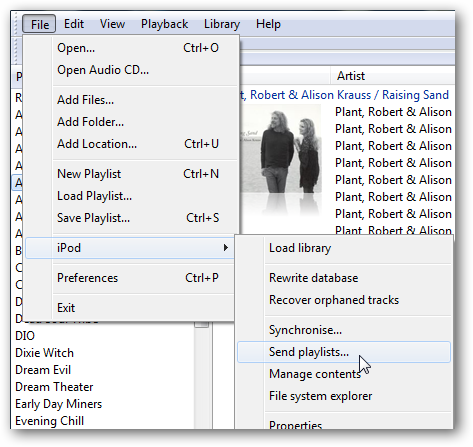 Are you an iPod owner but not a fan of using iTunes to sync your music library? 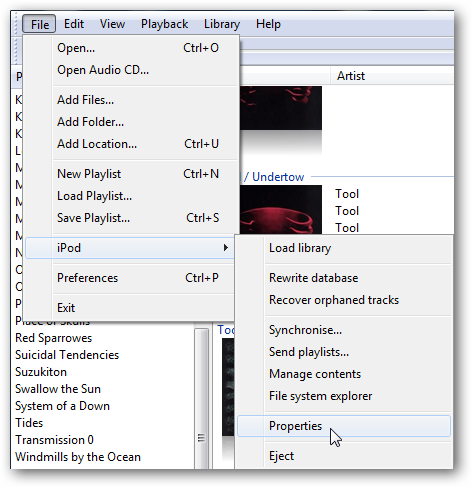 Today we take a look at using the fully customizable Foobar2000 to work with your iPod. If you’re looking for an alternative to iTunes that is fully customizable and will work with your iPod, Foobar2000 is a great choice. 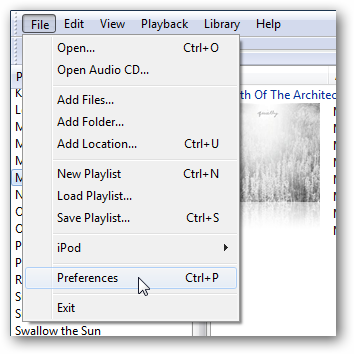 By adding a couple components we can get it to work with your iPod, and have it automatically convert FLAC and other file formats to ones that will work with the iPod. If you don’t already have it, you’ll need to download and install the latest version of the free Foobar2000 audio player (link below). The latest stable version is 1.0.3…you can do this with older versions as well if you want to. Installation is straight-forward and you can go with the Standard Full install. Once it’s installed you can use components to customize it however you like. 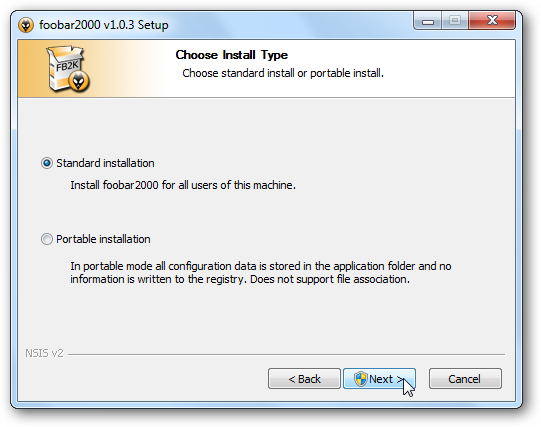 For more check out our article on customizing Foobar2000. 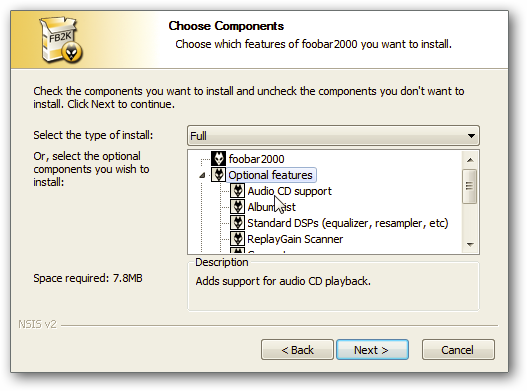 After you have Foobar2000 setup, we want to make it work with our iPod. 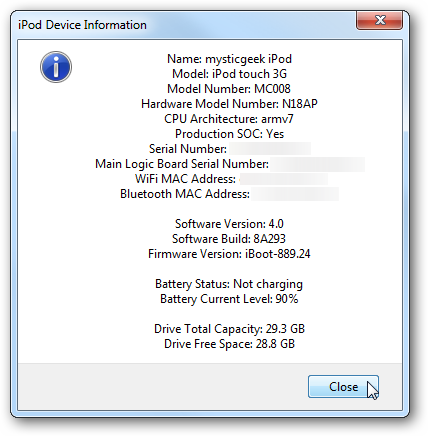 Download the iPod Manager component (link below). The current version supports with iOS 4 on your iPod Touch but not the iPhone 4. Unzip foo_dop.dll to C:\Program Files\Foobar2000\Components. 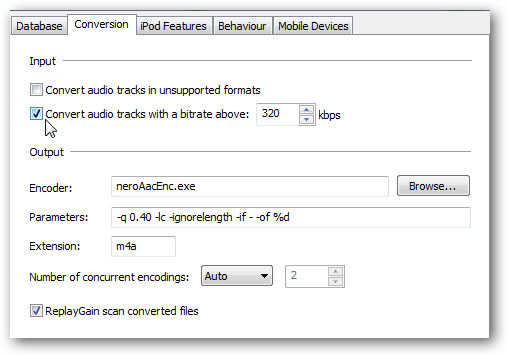 Next we need to download and install the free Nero AAC Encoder (link below). 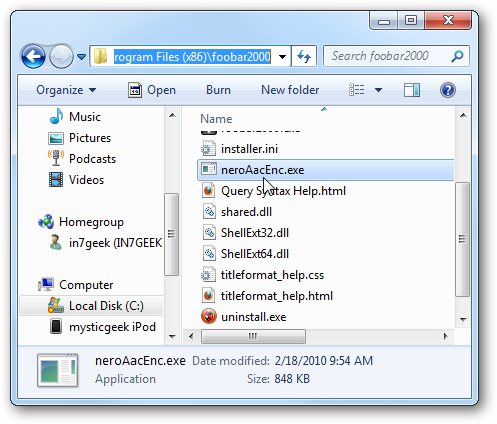 Unzip the file and go into the win32 folder and copy neroAacEnc.exe into C:\Program Files\Foobar2000. 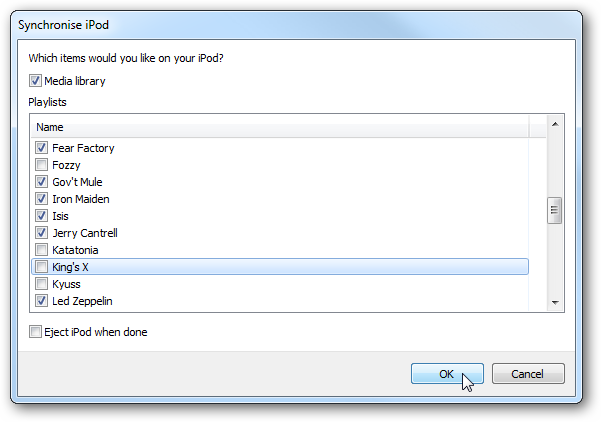 Then expand Tools and select iPod Manager. Now you can change various settings such as the Database, iPod Features, bitrate of converted files…and more. If you’re using an iPod Touch or iPhone make sure to go to the Mobile Devices tab and check Enable mobile device support then restart Foobar2000. 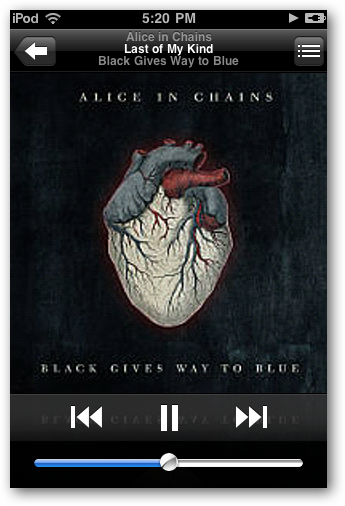 You might not want to load your entire library to your iPod and can add individual albums or songs. 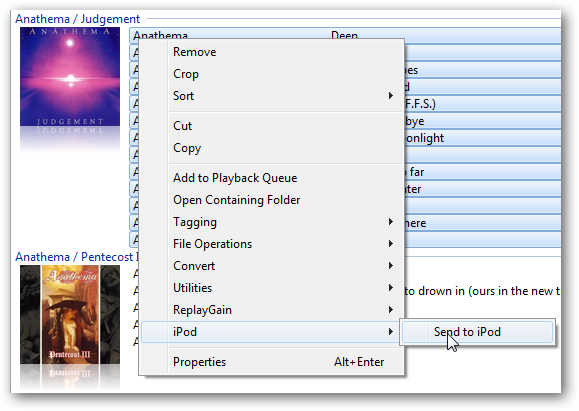 Select the album or songs you want to put on your iPod, right-click and select iPod \ Send to iPod from the context menu. 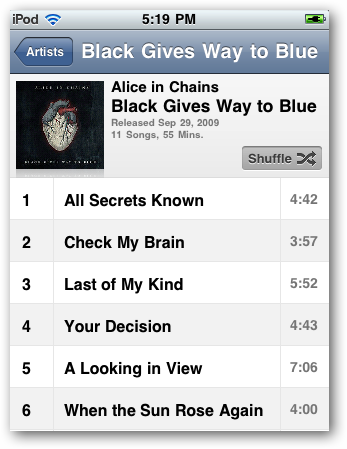 Your music will be processed and added to your iPod including the meta data and cover art. 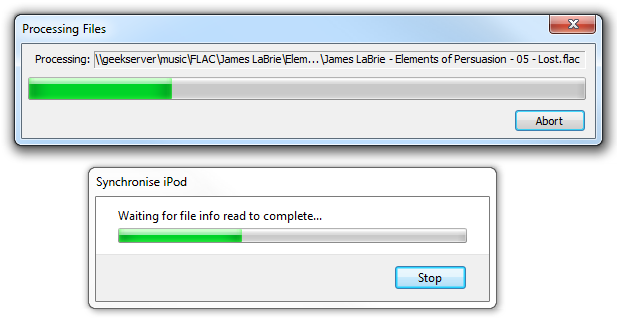 The files we are sending to the iPod are in FLAC format, so they will be encoded so the iPod can play them. Now go to your iPod music folder and you’ll have the album you transferred from Foobar2000 included as well as the cover art. Now you can go ahead and sync your entire Media Library or just select playlists. 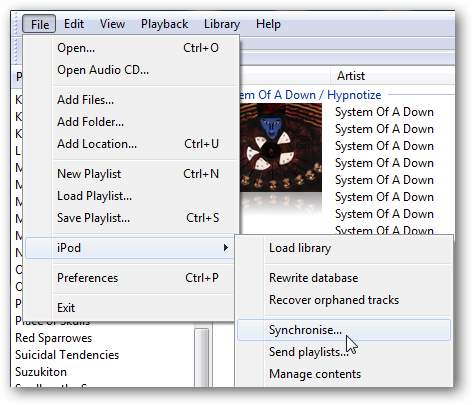 Note: If you only want to sync specific playlists, uncheck Media library and select the ones you want to sync. Otherwise your entire library will be synced up. 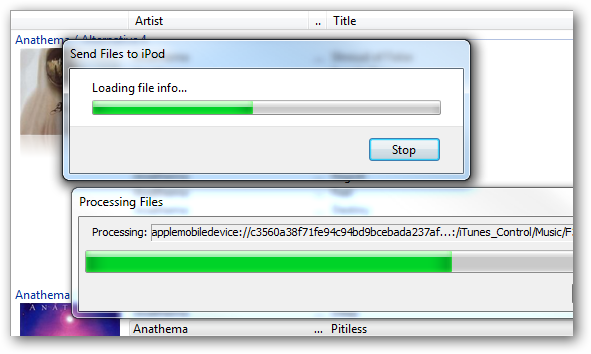 Just like with adding an album to the iPod, you’ll see the progress screens while everything is synchronized. The amount of time it takes will depend on the amount of songs your adding and how many need to be encoded for the iPod to use. 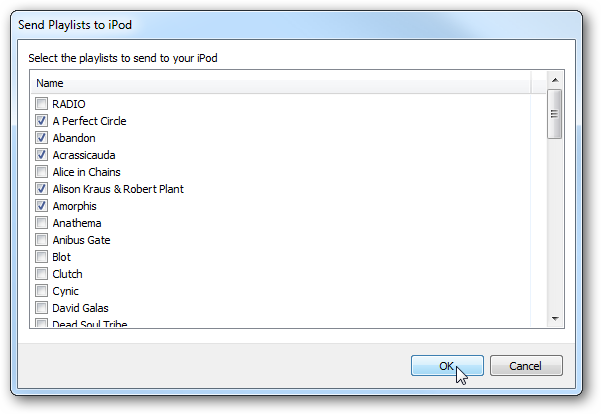 There is also the ability to send specific playlists to the iPod. Click on File \ iPod \ Send Playlists. 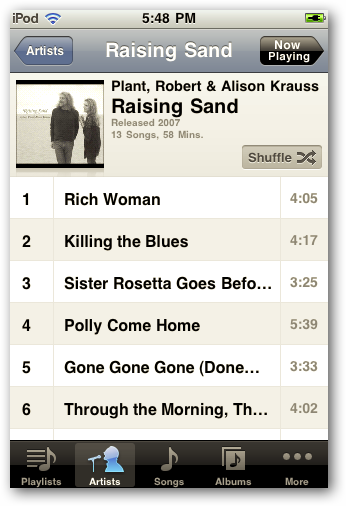 Now select the Playlist you want to add to the iPod. There you go! Now disconnect your iPod and enjoy your favorite tracks. 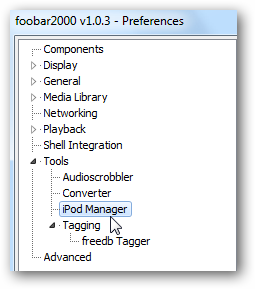 To get the details about your iPod or iPhone, in Foobar2000 click File \ iPod \ Properties. This will provide detailed info about your device. 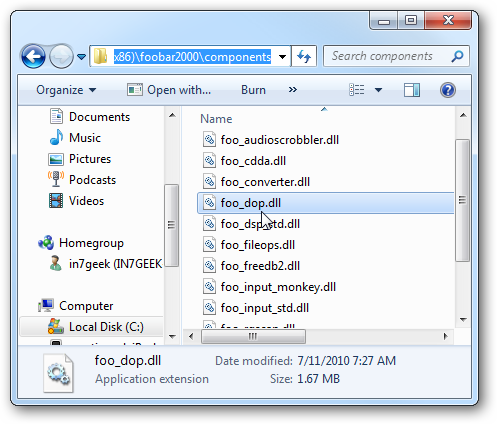 If you want an alternative to iTunes that is faster, fully customizable, and geekier in general…Foobar2000 will allow you to fully utilize your iPod. The cool thing about this is if you have file formats in Foobar2000 that an iPod can’t play, FLAC for example, will be quickly converted before added to the iPod. The conversion process is surprisingly fast, and the quality is very good. We took a look at the basic functions, but there’s a lot of customization you can do including how metadata is displayed, bitrate conversion, ReplayGain and more. What is your take? Are you a fan of Foobar2000 and use it with your iPod or iPhone? Leave a comment and let us know.